My grandfather, Joseph Benedict Dunne, was born in Dublin on April 16th, 1907. 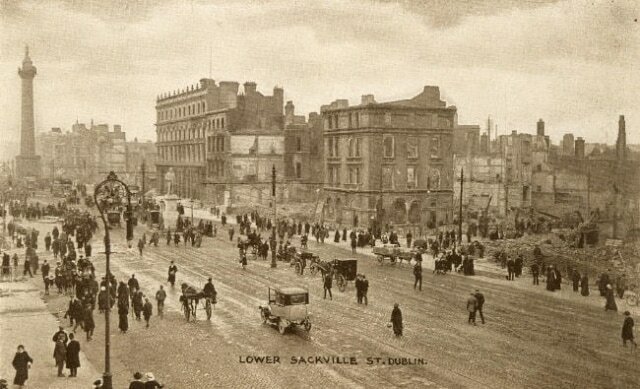 His childhood years were spent in a city bubbling with unrest, and in old age he still remembered clearly the dramatic events surrounding the Easter Rising of 1916. The city of his youth was scarred with the signs of civil strife and revolution – the gaping holes left by bombed-out buildings were a reminder of a lost rebellion, and his descriptions of scenes of violence in the streets brought it all very much to life. As one of nine children he learned early on to appreciate the value of a steady income and he worked hard to contribute to the family kitty. He was devoted to his widowed mother, Anne, and was looked to for guidance and support by his siblings. In 1928, in his 21st year, two events changed the course of my grandfather’s life – he was offered the opportunity to carve a career in the East with Gestetner, Ltd, and he met and fell in love with a pretty young teacher with a love of travel and a sense of adventure. After a few heady encounters, J.B. Dunne and Eilish Beglin said their good-byes, and embarked upon a four year long-distance courtship conducted through the post! Those first years in Singapore must have been exciting times for my grandfather. From a social point of view there was no end to the fun. Membership of the Singapore Swimming Club and the Tanglin Club provided an instant group of people to mix with. He joined the Royal Singapore Yacht Club and participated in countless rowing events, a passion of his already ignited from his days as a member of the Dublin Rowing Club. Work was satisfying and exciting. Gestetner had branches in Malaya, Siam, Java, the Philippines and Hong Kong, all of which were visited regularly by the young J.B. Dunne. The world of the East, with all its magic and allure, was weaving its spell with each passing day. Shortly after his arrival in Singapore my grandfather joined the Singapore Volunteers. In 1929 he was a member of the Scottish Company, and based on photos taken at the time I can see he wore the kilt with pride! The Volunteers, more than any other group, were to impact my grandfather’s life, and until the end of his days he remembered his fellow Volunteers with great affection. ​By 1932, having created a solid base in Singapore, J.B. Dunne was ready to marry his sweetheart who was patiently waiting in Dublin. For the first time in nearly four years he returned to the country of his birth to claim his bride. They married in October and six weeks later sailed toward their new life together. The Thirties were busy years for the Dunne family. 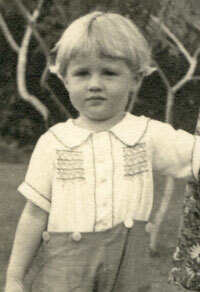 In 1933 Joe and Eilish welcomed the birth of their daughter Eithne. Her arrival opened up a whole new world to the young couple – there was the social dynamic of the Kiddies Pool at the Swimming Club, birthday parties and children’s teas became a regular feature in life, and as Eithne became a little older dancing classes and amateur dramatics occupied much time and energy. All this was fitted in to the very active adult social scene of dinner dances, film premieres, regattas and parties of endless and varying themes. By the time my father Dermot was born in 1938 the Dunnes were firmly established in the happy, hectic merry-go-round of ‘the good life’. But there were rumblings from afar. Europe was plunged into war at the end of 1939, and the already frenetic pace of life for many in Singapore picked up a notch as fund-raisers and entertainments for the troops were added to the normal round of “do’s”. ​My grandmother’s scrapbook of cuttings offers a glimpse into that whirlwind of activity dedicated to the War Effort, but in a curious way the spotlight seems to focus largely on who was seen where, and more importantly, what they were wearing when they were there! And then it all came to an end. December 8th 1941 was a rude awakening. 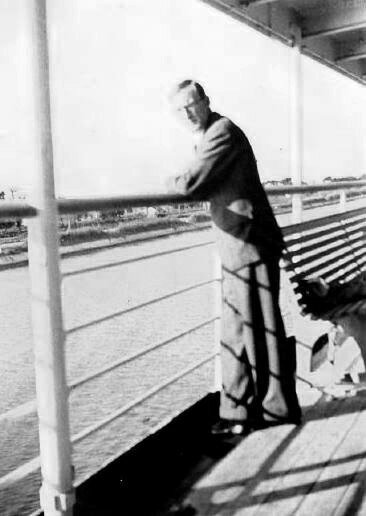 The air attack by the Japanese showed that Fortress Singapore was not impregnable, and on December 23rd J.B. Dunne secured passage for his family on a steamer bound for Sydney. He waved his dear ones off at the dockside, not knowing when they would meet again. The following six weeks for my grandfather were a blur of sorting out his affairs, packing up personal treasures left by Eilish and the children, keeping the office ticking over, and fulfilling his Volunteer duties at Alexandra Barracks. Nightly air-raids interrupted his sleep and he spent frustrating hours moving between the house and air-raid shelter in the garden. For the second time in his life he found himself in a city of destruction and death, but unlike his childhood experience where he could only watch the events unfolding around him, this time he was able to take an active part in the fight to protect the city that had brought him so much happiness. But the fight was in vain. On February 15th 1942 Singapore surrendered unconditionally. Weary in body and in heart, my grandfather turned in his rifle and joined the thousands already on the long march to Changi. Private J.B. Dunne became Prisoner 3037 and moved into a time of his life that he would refer to later on as his ‘hidden years’. ​During the first months of captivity my grandfather witnessed the deaths of a few of his friends. He was convinced that despair had contributed largely to their demise. Determined to ‘see it through’, the knowledge that his wife and children were safe in Sydney gave him strength and hope in times when he would be sorely tried. For fifteen months my grandfather moved between various camps in Singapore. He felled trees, collected bricks, cut grass, baled hay, built huts, unearthed tree stumps, hauled carts, and did anything else required by the Imperial Japanese Army. The hard work and long hours were easier for him to bear than the lack of food. At least the days went by quickly when he was busy. ​But hunger was a constant companion, and as the months went by he found himself experiencing the distressing side effects of a diet consisting mainly of rice and boiled hibiscus leaves. His hearing and his sight began to go and after a year of life at Changi he was admitted to the darkened Eye Ward of the Camp Hospital where he remained for nearly two months in a state of semi-blindness. Rice polishings were added to his meager diet in an attempt to combat further deterioration. But there were bright spots in camp life. Concerts provided a welcome distraction from the reality of daily life as a POW, and religious services offered comfort where nothing else did. My grandfather found himself reconnected with a Faith that he had lost somewhere along the way during the glittering years in Singapore. The promise of a letter or the longed-for delivery of a Red Cross parcel also helped to focus thoughts in a positive way. ​In May of 1943 J.B. Dunne’s name appeared on a list. He was one of nine hundred prisoners crammed in to the hold of the Wales Maru. They set sail the morning of the 16th and after three weeks of unimaginable filth and privation, torpedo attack and temperature extreme, they landed at Moji, Japan. Three days by train, by ferry and by foot ended at Hakodate Main Camp on the northernmost island of Hokkaido. Prisoner 3037 was given a new number which would be his identity for more than two years to come – 1087. My grandfather began the next phase of survival as a worker at Asano Cement. The POWs traveled daily to and fro across the bay by ferry to reach the factory where they toiled in an atmosphere of fine cement dust that settled in their lungs. After a few months a new Camp was built 200 yards from the factory doors. About a hundred prisoners settled in to their new home in October of ’43, just as the bitter winds of winter began to blow. Of the 36 Volunteers who had sailed together from Singapore only six remained together in this new camp. The half-built huts provided poor shelter. The icy atmosphere within the walls carried off three men in those first weeks at Kamiiso Camp, augmenting the already high levels of anxiety about health and comfort. Snow fell between cracks in the roof and walls directly on to the sleeping spaces of the prisoners, and the water in the fire-buckets froze at night. In this new land of earth tremors and glacial chill my grandfather longed for those far away days in sunny Singapore – even Changi seemed like a distant dream. The food situation was bad. The addition of fifty more prisoners to the “Cemento” camp meant a dip in rations. The occasional Red Cross parcel, usually shared, made life a little brighter, but the hunger was always there, gnawing away at their vitals. Mail was allowed, and this opportunity to communicate with the outside world, even though limited to 50 or 100 words per card, was a source of great hope. 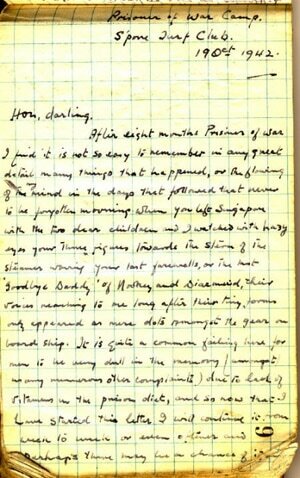 But it was a lucky draw – some prisoners received boxes of letters, while others, my grandfather included, received only a handful. 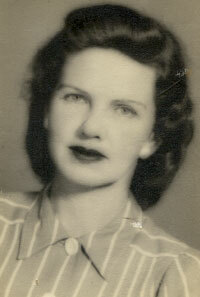 In nearly four years only four letters of 25 words each made it through from my grandmother. In June of 1944 my grandfather suffered a nasty accident in which he nearly lost his leg. This turned out to be a blessing in disguise. He was sent off to the Main Camp Hospital for care and remained there for two months. The foot was slow to heal and upon his return to Kamiiso, much to his delight, he was put on permanent camp work and joined the gardening squad. Having been an enthusiastic gardener pre-war, this was a most welcome change. ​A second winter descended upon the camp. Once again the world became a place of snow and ice but this time the prisoners were prepared. As the months progressed rumour of Victory in Europe began to take firm hold in the hearts of all who listened, and hopes were high that it would be ‘any day now’. And then the bombshell fell – the prisoners were to pack everything; food stores, kit, furniture, even the nails from the walls, in preparation for a big move inland. Nobody knew what to make of it. In June of 1945 the 152 souls who had lived so closely with each other for the last two years were split into two groups and sent to separate camps. My grandfather’s group went to Nisi-Asibetu, an isolated place high in the mountains where the air soon cleared away the ashen pallor of the “Cemento boys”. In this new camp of over 500 prisoners my grandfather continued as a gardener. He eyed each sprout with eagerness, calculating the time from sowing to harvest, impatient for the vitamin source to grow. The food situation was even worse than before – morning and evening meals were “stews” of mulberry or dandelion leaves, lunch was a bowl of rice with a teaspoonful of fish flakes. Obsessed with food, the prisoners tormented each other with fantasies of scrumptious feasts and created menus of their favorite foods. On August 15th the guards were observed weeping after a radio broadcast. It could only mean one thing! The previous weeks had been punctuated with air-raid alerts and wild rumours, my grandfather hardly dared to hope. But it was true – the war was over. The camp burst into activity in preparation for liberation. New uniforms were issued by the Japanese, kit bags were packed and repacked. Long hoarded treasures were sold or traded, trips were made to the local village in search of food and a constant bustle hummed through the camp. On August 26th four American planes appeared in the skies. They dropped 12 kitbags filled with supplies and as they fell to the ground many of the prisoners wept tears of joy. They were going home! A month would pass before J.B. Dunne, no longer 1087, would march through the camp gates toward freedom. Impatient to be off, he readied himself for the journey ahead. Amongst the precious items that he packed was a little bundle of notebooks and scraps of paper. It was a letter. 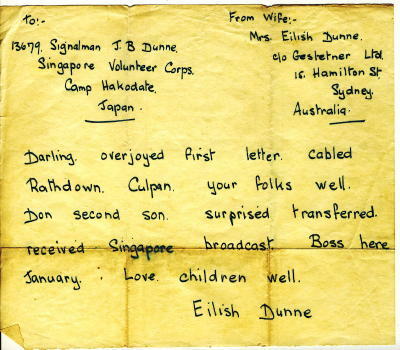 Started in Singapore in 1942, the letter to Eilish became a chronicle of my grandfather’s years of captivity, and in those pages he recorded a story of longing, faith, sadness, courage, love, and incredibly, humour. On September 12th 1945, after three years and eight months as a prisoner of the Japanese, my grandfather started on the long road home. On foot and by train the liberated POWs made their way to Hakodate. 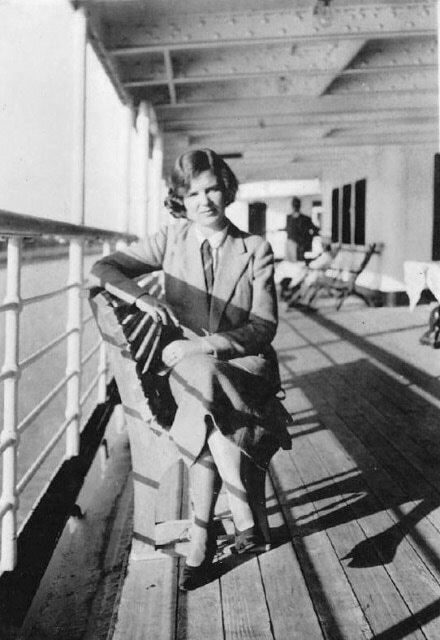 They boarded HMS Barfleur and headed south to Yokohama. From there the USS Monitor sailed to Manila, carrying my grandfather one step closer to his family. ​But he had to wait. There was confusion over what to do with the Volunteers. The majority wanted to return to Singapore and the East, but it looked as if most would be sent to the UK. Eventually it was decided that he could continue on to Australia because his family was there. On October 2nd HMS Formidable sailed from Manila with its cargo of emaciated men and eleven days later drew in to Sydney Harbour. My grandfather had fulfilled his promise – he had survived his ordeal to return to those he held dearest in all the world. Those first years following the war were a time of readjustment. My father, at the age of eight, had no recollection of the man who had suddenly appeared in the household. Eithne was no longer the little girl that my grandfather remembered, and he and my grandmother had to start all over again in every way. The war had stripped them of their house, their possessions and four years of their lives, but they were together again, which was more than many could claim. After a period of recuperation, various operations and other medical treatments it was time to pick up where he left off. By 1946 Gestetner had reopened the office in Singapore and like so many who remembered those magical days before the war, the Dunnes returned to the place that they felt was home. But nothing was the same. Too many of the old faces were gone forever and it became clear that the Singapore they remembered was truly only a memory. ​Once again my grandparents made a new start. They said goodbye to the East and all that they had lived over the last two decades. My grandfather founded his own company in Dublin and the Dunne family settled in the lovely Irish seaside town of Greystones in County Wicklow. It had been a long journey getting there, but they were home.